When I visited the Prada museum in Madrid, the focus was Diego Valazquez’s intricate “Las Meninas,” but the image of one of Goya’s “Black Paintings” – the disturbing portrait of Saturn Devouring His Son is hard to forget. Neil Olson imagines a mysterious missing addition to the famous collection the seventy year old artist painted on his walls – a self-portrait of Goya which hangs in the study of a wealthy collector, who uses it to control his family in the story of The Black Painting. Before he dies, the family is summoned to Owl’s Point to hear Alfred Arthur Morse’s conditions for distributing his wealth – the mansion as well as an extensive art collection. When she arrives at the mansion, Teresa, a student of art history, finds her grandfather dead, his face contorted in an expression of horror and his gaze fixed on the spot where the Goya painting once hung, The mystery of its thief and the patriarch’s diabolic intentions for his progeny create a thrilling story of deceit, corruption, and dark family secrets. Using a cabinet currently on display at the Rijksmuseum in Amsterdam built in the late 17th century to replicate Petronella Oortman’s luxurious townhouse in the center of the city, Jesse Burton creates a tale around a poor eighteen year old girl in an arranged marriage to a wealthy Dutch merchant in The Miniaturist. As Nella struggles to find a place in her new opulent home, her husband, Johannes, leaves her alone, disappearing for days, never consummating the marriage, while her new unmarried sister-in-law bristles at the competition for control of the household. To appease her loneliness, Johannes buys Nella a replica of their house – a large doll house – and instructs her to find a craftsman, a miniaturist, to fill it with miniature furniture. Suddenly, the Miniaturist takes control of the plot. With eerie foreshadowing and obscure messages the Miniaturist predicts Nella’s life, sending her new pieces for her dollhouse before she requests them. A sudden shocking revelation changes the momentum and story evolves into a cross between an Alfred Hitchcock mystery and Morgenstern’s Night Circus. I enjoyed every bit, anticipating the next surprise – a betrayal, secret lovers, a baby – with a warehouse of sugar both sweetening and decaying the characters. To be immersed in the drama, you must suspend belief. Burton paints an authentic picture of the old Dutchmen: the burgermeisters with their forbidding rules of the city, the power and wealth of merchants, and the strict Calvinist Minister dictates – all adding to the intrigue. What if – you found a letter with instructions to open after the writer died, but that person was still alive – would you open it? 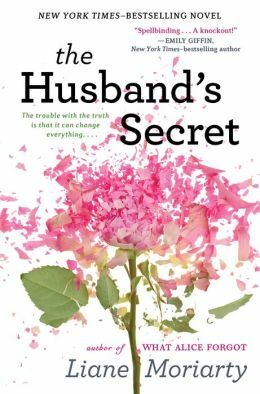 I would not be able to resist, and when Liane Moriarty teased with that cliffhanger through several chapters – about 200 pages – of The Husband’s Secret, keeping the contents hidden, the speculation of what is in that letter is as much fun as learning the actual content. If you remember Moriarty’s What Alice Forgot, you know she can take an improbable storyline and drench it with humor, pathos, and even a few life lessons. Three lives intersect in this drama: Cecilia finds her husband’s sealed “do-not-open-until-after-death” letter in a stack of old tax forms, while he is on a business trip; Tess flees from Melbourne to Sydney with her young son when she discovers her husband and best friend have fallen in love – and asked that they all live together as one big family; Rachel’s beloved two-year-old grandson is about to relocate with his family to New York City, as she continues to search for the murderer of her teen-age daughter, killed twenty years ago. Yes, there is a murder, but the mystery of whodunit is solved early in the tale, with consequences and suspicions connecting these three women’s disparate lives. The story premise is captivating – I read it quickly to know the outcome, and Moriarty does produce an unexpected surprise at the end. After the shocking climax, the denouement offers more likely “what if” scenarios that have a nostalgic effect, but the clear message to be responsible for yourself, not everyone else, can connect to all of us who get tired of being good all the time. Hard to categorize Moriarty’s style – more than chick lit, mystery thriller, romance, beach read – and always satisfying. Now I’m looking for some of her earlier books – seems there are quite a few I’ve missed from her website. 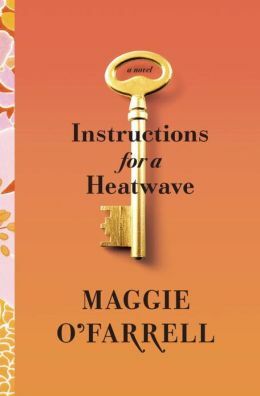 Family secrets are Maggie O’Farrell’s forte and her latest novel – Instructions for a Heatwave – combines her facility for everyday drama with shocking revelations. If you’ve read O’Farrell’s The Vanishing Act of Esme Lennox or The Hand That First Held Mine, you know to raise your expectations for a surprising twist in the plot. The heat in London is unbearable when Robert, a retired banker, decides to take a walk, but never returns, leaving behind his Irish chatterbox wife, three grown children, and a couple of grandkids. The story moves across London, Ireland, and New York City in 1976 – just before the electronic media made secrets archaic. As Aoife (pronounced ee-fa, the Irish “Eve”) returns from New York City to the London house to help her brother, Michael Francis, and sister, Monica, in the search for their father, Robert’s disappearance fades into the background as O’Farrell reveals the diverting background lives of each character. Everyone has a secret and no one is happy, except perhaps Gretta, the frantic mother who lives in denial. Michael Francis, the eldest son, is a frustrated Ph.D. wannabe who teaches history at a local grammar school and has recently had a one-night stand with a fellow teacher; Monica, divorced from the love of her life, cannot seem to assimilate into her second marriage with her new husband and his young daughters; Aoife, hides her dyslexia from everyone, including Gabe, her new lover, who sends her love notes she cannot decipher. Gretta has an irrational penchant for cleaning out shelves when stressed, and cannot seem to stop talking or giving unwanted advice. After finding check stubs that date back fifteen years, the family takes the ferry to Cork, Ireland, in search of their father. Of course, there is another woman, but not in the way you may expect; the checks are sent to a convent. As Gretta reveals the mystery, the truth jolts the family – first into further chaos but eventually into redemption with an ending that renews faith in the ability of loved ones to come through for each other when needed. The family rallies and survives, but Robert is another story. He appears in the beginning and in the end, only as a phantom catalyst. I wonder what a good book group would conclude about his future – O’Farrell leaves it open. I liked the way Maggie O’Farrell can take dramatic incidents and weave them into meaningful moments that connected to me. When she described Aoife breathing in the scents of her parents’ bedroom, it brought back the first time I returned to my childhood home after my father died, and anyone who has siblings will recognize the pride within the rivalry, the understanding and the annoyance. O’Farrell’s stories are dramatically intricate, and if you are looking for neatness and straight story lines O’Farrell cannot deliver. After all, family relationships are messy.